Home Interview Interview with Dr. Bagher Ansari : in terrorist events, in addition to those killed, society is victim in whole. 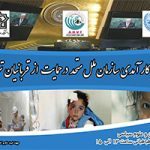 The Association for the Defending Victims of Terrorism has conducted a special interview with Dr. Baqir Ansari, a faculty member at the University of Shahid Beheshti University, at the start of the 40th session of the UN Human Rights Council in Geneva. Dr. Bagher Ansari possesses some academic works on human rights, as well as numerous academic papers presented at some conferences and research centers. 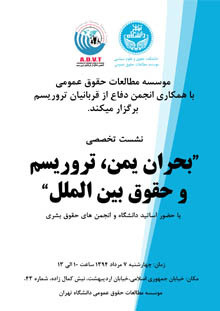 The seven-volume collection of “International Human Rights Documents”, “freedom of information”, “privacy rights”, “human rights education”, “education rights”, and “the rights to collective communication” are included. In this conversation, we have discussed topics such as the effects of terrorism on observance of human rights standards, the rights of victims of terrorism and criminal justice for those responsible for terrorist acts. The full text of this interview, which was conducted in his office, is available in the research section of the website. Dr. Bagher Ansari ,I am very glad to serve you in this interview. The Association for the Defending Victims of Terrorism hopes success to you on behalf of the families of the victims of the terrorist attacks. As a first question, how do you assess the international mechanisms, in particular the United Nations, for effective protection of human rights, including the rights of victims of terrorist acts? I also thank you and the attempts that are being taken by ADVT to defend the rights of the victims of terror. I wish you good luck. In order to answer this question, it seems that we should first consider a few introductory points. In the first place, we need to determine who the victims of terrorism are. The next point is that what the United Nations means when we are talking about victims, what mechanisms and organizations we are considering of. These are key points. The next point is to see what the ground we want to follow is. At least in the area I want to enter. In the meantime, I would like to point out that my discussion is mainly the subject of international human right law. Let’s go back to these points and explain a bit about them. In the first case, which, in my opinion, is a very key concept, when we say what the victims of the terror are and whose rights they want to speak, we say in the first place that the person who was targeted in a terrorist operation is the victim of assassination Now, this person may be alive or may not. Whether it’s alive or not, its condition varies. Families and relatives are ranked secondarily as victims of terrorism. The society in which this person lives in, the person who is a member of a group, is a member of a minority, brings together a series of common values of these individuals. And for the sake of those common values and goals this person can be targeted. Naturally, the members of that community, because of the solidarity that exists between such community and those individuals, are affected by the action taken against one of their members, and at a wider level, the larger community and the national community where the terror is taken place. Inside any country that terrorist acts happen, naturally, its people will be affected by this event. And ultimately, it is the international community itself or the international community to be the victim of terrorism, because terrorism is, in any case, an act against international peace and security. When there is a terrorist act in a country, other countries or other people are worried or afraid, terror will also be created about them. So, when we talk about the victim of terror or the rights of the victims, we should observe who they are and how they are affected by the acts of terrorism and how their rights are affected. And what kind of measures can be followed, For example, to pursue national or international capacity, then we need to re-examine these capacities. If I again want to categorize the victims of terrorism and terrorism in terms of human rights, I can say that terrorism has both individual and collective effects. In other words, there is both a person and a collective dimension. Individually, later relates mainly to nationality. That is, if a person becomes a victim of terrorism somewhere, it is mainly the government that is responsible for protecting and protecting this person, as well as protecting the rights of the family or relatives of this person. Slowly But in the collective dimension, the situation is different, in the collective dimension, everyone is responsible for defending the rights of this person, which is to say that everyone is responsible, mainly discussing the rights of the third generation. The collective dimensions of human rights, which can include the media, NGOs, scholars, clerics, and individuals, may include international organizations, or, as the term of some human rights writers, includes anyone who can take action to condemn or pursue this discussion. However, this is the first point, because we must see what the human rights system’s capacity to protect individual rights is. And what about the human rights system’s capacity in human rights dimension? Which will be mentioned later. Before I enter into a detailed discussion, I can point out that in general in the individual dimension, the capabilities of the human rights system are relatively strong, but very weak in the collective one. And this is one of the points I would like to mention first. But if I want to answer this question, I think we need a different breakdown. And that is in whose state jurisdiction the terror has taken place? It is important, therefore, to answer this question whether it is within state jurisdiction that has accepted international human rights norms and international human rights obligations. And has also accepted or refused the authority of human rights ombudsmen. If it falls within the competence of a government that has accepted international human rights norms, it has accepted the competence of regional or international human rights bodies to monitor its performance, it will be possible for those authorities to protect the rights of victims of terror. But if it is in the power of government that has not accepted these competences and has not accepted a human rights norms or the jurisdiction of human rights bodies, then naturally, we cannot expect many of these agencies strong and effective support. How the United Nations capacity can be increased on the protection of the rights of victims of terrorism? The entire United Nations system for protecting human rights can be divided into two categories. Mechanisms whose gender or nature is political, that is, mainly representatives of governments there. And the mechanisms that I can say to some extent are quasi-judicial. For example, we can say that charter-based mechanisms or mechanisms of human rights based treaties. The charter-based mechanisms are largely political, and if I want to enumerate, the General Assembly of the United Nations, the Security Council, the United Nations High Commissioner for Human Rights, the Human Rights Council and other bodies that enter specific areas. For example, the Secretary-General of the United Nations has an important role in the field of human rights, and a number of other institutions that are active specific areas of human rights, such as UNESCO, ILO, UNICEF and the High Commissioner for Refugees in a particular area. These institutions, which are composed of non-state actors, represent the political will of governments, and, in accordance with the provisions of the Charter of the United Nations, as well as Articles 55 and 56 of the Charter, it is an obligation to cooperate with each other in the realization of human rights, in order to achieve the goals of the United Nations, To international peace and security and the realization of human rights and fundamental freedoms. In fact, the issue of commitment to cooperation in the international human rights system is usually raised at three levels: at the level of civil and political rights, usually minimal international co-operation is required. In terms of economic, social and cultural rights, more cooperation is needed to achieve this. In the case of those rights of a collective nature, the commitment to cooperation becomes more prominent, for example, in the discussion of the victims of the terrorism of this feature. Commitment to cooperation is obligatory so not minimal commitment; the minimum commitment, means the government, does not impede the realization of rights. While maximum cooperation is mainly in positive cooperation, it should take appropriate steps to avoid a violation of law and, if violated, to compensate for it, and perpetrator of a violation of the law, remain unpunished and unenforceable. In the context of the United Nations’ political institutions, the initial expectation is that, in any incident of terrorism, the relevant political institutions, those who have been victimized, with the people and the society where the terror is located, Sympathize. Second, they must condemn and denounce the act. Third, follow the steps necessary to discover the perpetrators, and they must work together to pursue, prosecute and punish perpetrators in all these areas. At least at the political level, this should be demonstrated, for example, this act is condemned by the Secretary-General of the United Nations, the Security Council and the General Assembly. Similarly, governments in their own internal system must not allow the so-called “suppressed” terrorist acts get support. For example, if there is a terrorist operation, a government should not allow the media operating in that country to support this terrorist act, or to recegnise and praise this terrorist act. And here, the United Nations institutions in appearance claim that we are loyal to this, but whether or not it is a terrorist act is a matter of dispute. As a result, an action which, in the opinion of a state, amounts as a terrorist act, is not considered as such by another government, so it supports it. The government expects other governments to prohibit or provoke action, because it regards it as an incitement to terrorism, and says that the media or satellite network that you are allowed to do is provoking terrorism. Or this site that works on the Internet is engaging in propaganda for terrorist groups, so it asks other governments to deal with them. The other government, with its own definition of terrorism itself and having a different viewpoint that is affected by the political approach of each state, may not carry out specific punitive measures. Now, one of the gaps we have in this area is that we do not have a clear definition of international terrorism. Mostly, the definitions are specific, that is, terrorism has been accepted in specific instances. Well, this is one of the problems that challenges the political mechanisms of the United Nations. But in the field of treaties, we now have 9 committees on human rights treaties that are active. Any resort to these institutions by terrorist victims depends on which state is in the jurisdiction of the act, the state which has accepted or refused the competence of these treaty-based committees. If a government accepts these competences, the victim of terrorism within the jurisdiction of that state can resort to the treaties and ask them to defend their rights. Of course, you have to first resort to civil action in the country and apply to the authorities. And usually governments are working on victims of terrorism internally to provide them with a sense of security and make compensations. 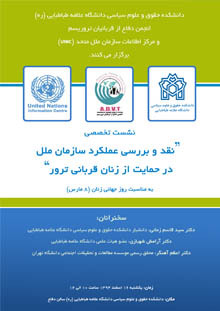 The international human rights system has obligated governments to pursue and make remedy actions against the rights and freedoms of individuals, including terrorist acts, and to take measures and guidance for them in order to appease the survivors of terrorist incidents and to prevent similar actions. For example, how they should plan a funeral and burials and to have memorial sites as well as compiling sympathy for them. Some governments have gone a bit beyond these. For example, they have created funds as solidarity funds. In this sense, the person who is the victim of terrorism, the public expresses solidarity with this person. Since most of the victims of terrorism are blindly chosen and, in this regard, are considered innocent, the solidarity fund compensates for the damage to these individuals by people. And if the victim needs to use relief for the rest of his life, he will be given this sort of assistance. Some countries have these funds nationally. At the moment, there is sometimes some claims that there can be solidarity funds available internationally, especially in the case of terrorist attacks that are international or transnational. What changes should the United Nations have to make about its current structures and programs in order to establish lasting peace as well as to reduce armed conflicts? The right to peace as one of the third generation rights is seriously contested at the international level. There is a major controversy between governments that defend the right to peace and countries that still do not accept this right as third-generation rights. Most developing countries are in favor of the right to peace, and mainly powerful states and armed industries possessors, especially military arsenal, are opposed to the right to peace. Since 1984, when we have the first General Assembly resolution on the right to peace, as the right of peoples to peace, until the second resolution of the General Assembly, issued in 2016 as the right to peace, has taken a lot of efforts to make the Comprehensive Declaration. But if you look at the results of this 2016 announcement, you’ll see that the announcement has only 5 or 6 clauses. It shows that the power of resistance has been very influential on the right to peace. They do not allow the concept pursued in the human rights system to be realized. Theorists and peacekeepers believe that peace should be pursued on four levels: at the individual, group, individuals and groups level with their governments and at international level, and for each of them, consider the obligations and assignments. Among the discussions that are being discussed at the same level at different levels is that, in the individual dimension, peace talks will not be realized unless peace education is to take place. Also, training terrorist activities should be prevented globally. This is not acceptable, for example, a government tries to give formal training in schools and elsewhere to individuals to carry out terrorist acts. In a group, for example, it is imperative that governments work on the same subject as the culture of peace. We have also had a decade in the name of the culture of peace, and prevention of violence against youth. Different international measures were proposed for that decade to follow. However, when you observe actions taken by governments or the international community in this regard, it is clear that they have not achieved much success. Many international efforts have been made to realize the right to peace, but not enough. One of these efforts is to establish the rule of law in international relations. International democracy will be established. International institutions should turn from mass-based voting systems to majority voting systems. Internationally, all states should take serious measures to disarm or to prevent a nuclear arms race or weapons of mass destruction. The issue of arms trading is internationally limited, that is to say, to observe whether the arms race has been reduced since 10 years ago. However, it wants to use these weapons to kill, especially light weapons, which are also used for terrorist acts. Well, when we observe the sum total, we find that there has not been much success in the area of the right to peace. And in these components of the right to peace, the prevention of terrorism is usually one of the issues. one of the axes of the right to peace is that terrorism must be prevented and strongly addressed. An initiative that is always spoken in the international community is to prohibit the propaganda of terrorism or incitement to terrorism. But provoking terrorism does not yet have a clear definition of what we are saying about provoking terrorism. Of course, what is happening at the international level, is restrictions related mainly to the media of the Islamic countries and the Middle East. For example, the European Convention on the Suppression of Terrorism or the European Convention on Cybercrime and its associated protocol on incitement to racism or xenophobia have been largely concerned on individuals. If we look at it, we see they are about satellite networks and sites mainly from countries in the Middle East. Does this mean that these countries themselves are not provoking and promoting terrorist activities? There have been very few cases in the European Court of Human Rights concerning the propaganda and propaganda of terrorism that is incitement to hatred. but when officially and practically states like the United States or representative of the European Union at the Council of Europe declares that it is still too early for the right to peace, then there should be well worried. These countries can defend actions and activities that are not peaceful, that is, when they say that the right to peace is too early, I want to do things that you respect and regard as peace. So this is a serious challenge, and as a result I can say that the UN has not had much success. It does not mean that it did not succeed at all, but it had a very limited success. If you look at the drafts of the “right to peace” at the Human Rights Council, you will find out how much source it possesses, in particular, for the Spanish organization that initiated this declaration. But the major part of the drafts was eventually eliminated. The output of this struggle was a 5 or 6 announcement. A document that is merely declarative and has called on governments to protect human rights and fundamental freedoms and development. Namely, he has re-referenced peace to the rest of human rights. Internationally, in the debate on solidarity rights, there are two national and international dimensions of the right to peace. The powerful countries mainly state that if you, independent states, respect human rights in the national dimension, you do not need to worry internationally. Other countries say that it is not that sort. until the international dimension is reformed, and there is no international change in the international system and structures, we may not have a particular national dimension. The rights of solidarity or the third generation of human rights emphasize that national and international human rights dimensions are interdependent and that both should be taken into consideration. For example, the national dimension of democracy is important, the rule of law and human rights are also important. And in the international dimension too, it’s not possible to say to a government that you have to have the rule of law, democracy, but in the international institutions, for example, at the Human Rights Council, these rights are not observed. How do you assess regional cooperation to strengthen the protection of human rights and the fight against terrorism and, what mechanism do you recommend for effective and effective implementation? In the area of regional cooperation, I think that in the region of Europe, cooperation in the field of counter-terrorism has been activated, but with specific definitions of that area about terrorism. Are there other particular definitions of terrorism in other areas aimed at producing corporation? Unfortunately, there are no serious arrangements for regional human rights cooperation in the Middle East. Islamic countries, although haveing Islamic cooperation mechanisms, still do not succeed for cooperation in the realization and protection of human rights. The Arab League, despite having the Arab Charter on Human Rights, has not been successful in protecting human rights. Currently, the recognition of the right to peace and the right to development in the regional human rights system of Africa and other specific features of this system, including the identification of jurisdiction for a wide range of individuals who can complain to the African Commission on Human Rights and Human Rights as a result of human rights violations has made relatively good capacity for this system available The to the victims of terrorism and others for resorting to the mechanisms of the region. However, there are no concrete support measures in the regional systems of the United States, Asia and the Middle East. Of course, one of the international mechanisms that has the potential to prevent and deal with terrorist acts has so far been neglected and given little consideration is the intergovernmental complaint mechanism of the 1965 Convention on the Elimination of All Forms of Racial Discrimination. Recently, the Qatari government has used this mechanism to sue Saudi Arabia and the UAE. It has been used by Saudi Arabia and the United Arab Emirates after boycotting Qatar. Palestine also used this mechanism against Israel. All three complaints were in 2018. Of course, countries are in the regional framework but have resorted to international institutions. Under this Convention, apart from the accession to the Convention, no separate declaration of will for the acceptance of jurisdiction over an intergovernmental complaint is required. Qatar has used this capacity and complained against the governments that have joined it. Of course, we have to wait and see what the outcome of this investigation will be. But in general, both in terms of normative and supportive mechanisms, there is a serious vacuum in the field of human rights violations, in particular the rights of victims of terrorism at the level of the Middle East. Criminal proceedings have always been introduced as undermining the foundations of human rights, how do you assess the lack of adequate and effective prosecution and prosecution of terrorists as a factor to undermine the human rights of victims of terrorism? To answer this question, I can use a metaphor, two similar issues to terrorism, one about the involuntary disappearances, and the other, perhaps, the subject of torture. The two are cases that the government itself may commit, or the government does not commit, but others, in this case if the government witnesses such conduct or keeps silence, then the government has a responsibility. The issue of forced disappearance is a phenomenon that has become widespread in the United States in the 1980s, and as a result there was a concern that should be addressed. Perhaps United States is the only area in which it was sensitive to this issue, because the military officials was governing the country and the opponents were often missing, either directly or indirectly. Accordingly, there was a sense of need to have regional arrangements to deal with unintentional unenforceability. In the 1980s, we also have a discussion of the Torture Convention. In the issue of torture, the government may not commit torture, but the government will well be aware what individuals are prosecuting others, but remain silent, in the way the responsibility for torture is attributed to the government too. In both cases, torture and unintended unexpectedness are discussed in almost all cases. We have serious international initiatives in the 80’s and 90’s. In this initiative, a very basic right has appeared, in the name of the right to the truth. Wherever forced disappearance or torture goes unpunished or tortured, firstly, the victims themselves have the right to know who committed such acts, who are the perpetrators and organizers. 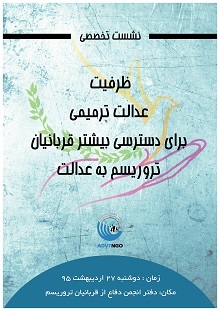 And secondly, it says that they have a collective dimension, for this point this issue resembles the topic of terrorism, because it scares the community and the people of society, creates fears in both of them, thus declaring that society has the right to know who They have committed these. If even this crime is located in another country and the person is buried there, his relatives will be allowed to return his body to original country, so as to take his ceremony, to build a memorial to him that will always remain in the minds. And these are actions that sometimes we consider them as those in the terrorist acts that killed children at a school. These commitments states that they will have a memorial on order to always live in memories and that people will always want to denounce the perpetrators. In my opinion, the discussions on terrorism are very similar to those of the two issues that I have spoken about. Consequently, we may need a similar measure. Similar measures, for example, the Convention on the Prohibition of Torture, are the only convention that has two oversight committees, one for the Prevention Committee, in the way that Committee is mainly concerned. The discussion of immediate, serious and ritual measures in both committees is foreseen. In the terrorist operations, it is almost the same, and it can be used for similar measures. The right to the truth can also be used to support the victims of terrorism. The United Nations General Assembly has a Declaration on the Right to the Truth, and the Human Rights Council has emphasized it. In this way, when there is a terrorist act, all governments should cooperate in order to discover that fact, find out who committed it, why it was committed, and what are the results, whether the perpetrators were persecuted and punished. Scandalizing and blaming the perpetrators can prevent these actions and prevent a country from explicitly advocating this action or terrorist group. 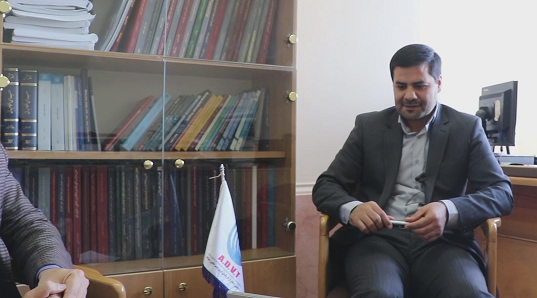 Dr. Bagher Ansari, Thank you for participating in this interview.